Darwin Mall will always be the heart of Darwin. Even though most retailing and industry have relocated, Smith St Mall is the Tourist Centre and original CBD. 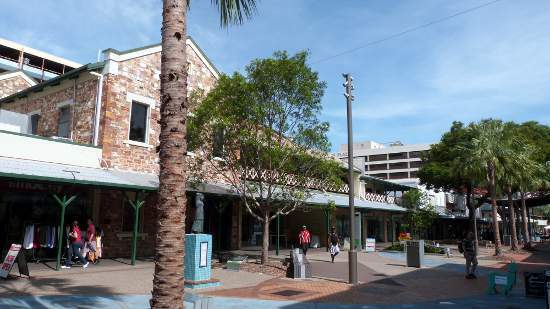 Site of the Victoria Hotel, the original theatre and the early commercial centre of Darwin, The Mall has undergone several facelifts as the city changed and modern retail shopping centres developed in the suburbs. Much of the mall was rebuilt during 2010 to provide a more usable and attractive pedestrian experience for visitors and shoppers. 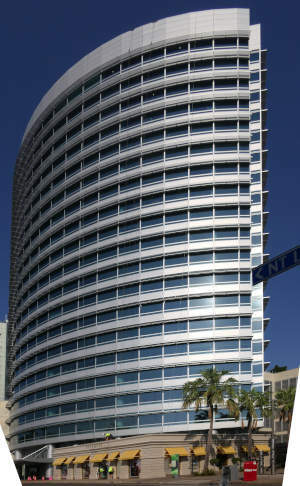 As the above photo shows, older trees were replaced with smaller palms, providing a more open, cleaner pedestrian mall. 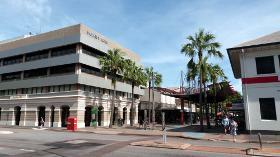 Darwin City Council provides a the Wi-Fi network in the Mall. 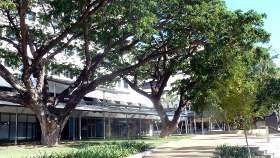 To use the wireless internet, the community simply have to click on the connection labelled Darwin City Council to view the terms and conditions. Once accepted one hour of free wireless internet is activated and can be repeated every six hours. Raintree Park provides an attractive inner city open space and is often used for community functions. 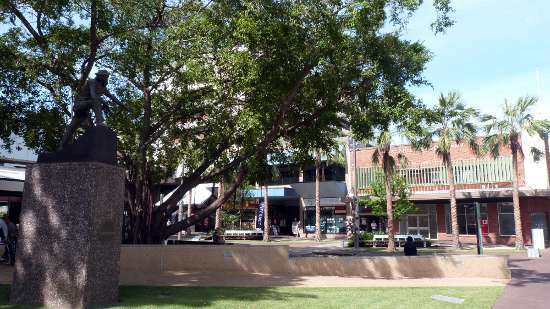 The two massive trees and extended awnimgs provide a pleasant setting for local office workers and visitors to enjoy a lunch time break or relax in the shade. 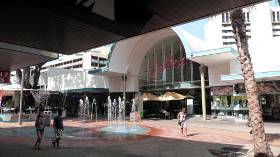 The mall is a show case for many of the special procucts of the Northern Territory. 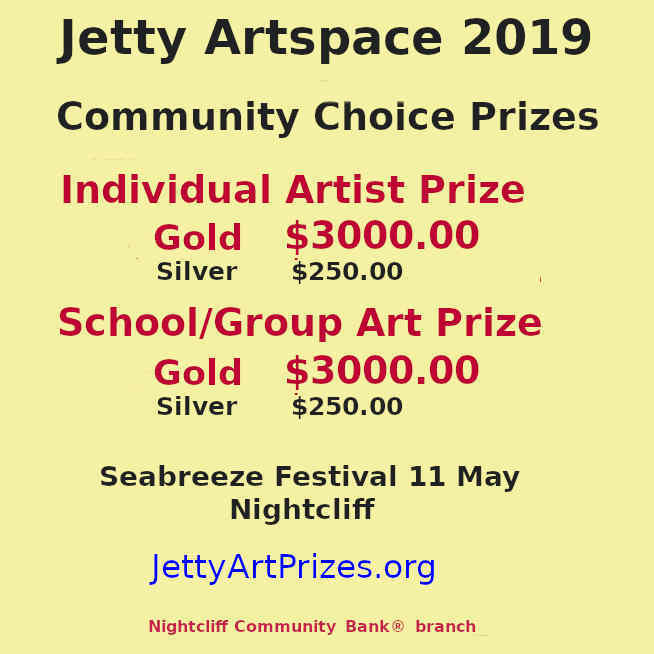 Aboriginal arts and crafts, pearls from the NT's pristine tropical waters, crocodile skin handbags from local crocodile farms and other unique souvenirs of Northern Australia are all on display here. 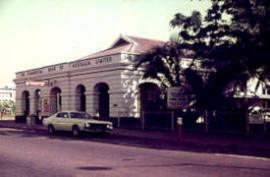 Several arcades make it an easy walk from the Mall to Cavenagh Street on the north side, or Mitchel Street and the Esplanade on the South. 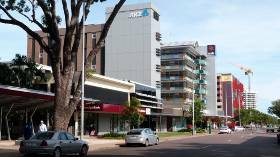 Darwin CBD is not a large city area so the mall is only a five or ten minute walk from many of the main hotels along the Darwin Esplanade. A newly built walkway connects the Bennett Street end of the Mall to the wave pool and wharf area, with more accommodation, restaurants, the convention centre and places of historic interest. The Darwin CBD is changing quite quickly with new buildings appearing faster than I can photograph them! Just on the opposite corner is the Visitor Information Centre and the Big Bus which does a loop of popular tourist places every 60 or 90minutes. 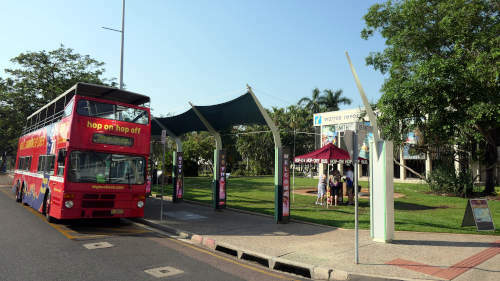 The Tour Bus offers hop-on hop-off loops from the city to Cullen Bay, the Casino, Darwin Museum and Fannie Bay, returning through Parap and the Fisherman's Wharf. 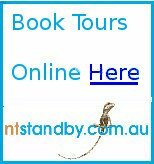 Tours change between the wet season and dry season, so check the timetable at the time of your expected tour. Return from Darwin Mall to Enjoy Darwin Home.